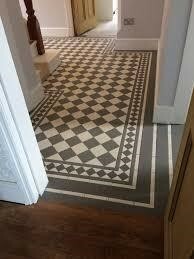 If you are in the enviable position of owning a house built before 1930 there is a very good chance that underneath the carpet or lino of the hallway there may well be a beautiful arrangement of Victorian ceramic tiles waiting to be discovered. Why cover this up? You’ll find that the workmanship and skill that has gone into creating this should be showed off in all its glory. Our Victorian era ancestors were very much the outdoors type both on terms of employment and leisure so they needed these hard floors to collect the mud and grime of the day when they arrived home. Our lifestyles have meant we’d rather have a bit of warmth and softness when we come home. If you need to sort out your flooring then we not give Commercial Contract Flooring Gloucestershire a look at http://gnccontractservices.com/fitting/. If you do expose your tiles how should they be spruced up? There could years of grime on them but the beauty of the ceramic tile, as our Victorian Ancestors understood is that they can be cleaned easily and with a minimum of fuss, effort and cleaning material. Some of the colours and patterns that were made are certainly worth the effort and it will make you hall look stunning. You need to arm yourself with the following items. Some Rubber gloves. You will need to use a specific cleaning agent, more about that later, so protecting your hands is important. A large bucket. This will hold the hot water and cleaning agent. Make you have a sturdy handle. A selection of hard brushes. Elbow grease is going to be needed, but the effort will be well worth it. A long handled brush will make it easier but a short handle for stubborn and edge areas will also be required. Stone cleaner. There are plenty of on the market and you will need one. They are not overly expensive and you will get many uses out of it over the years. A paint roller. To protect the surface after you’ve cleaned it and it has dried out, usually after a few days, you will need to apply a sealant. This means you won’t have to keep on doing the job every month or so. A paint roller is perfect for this as it ensures an even spread. Once you have a gleaming floor it will last for ages. A few mops no and again will keep it right as rein.